Dealing with hair loss could be very frustrating and upsetting for anyone. It is not uncommon to see people become anti-social and mentally depressed as a result of losing hair. While hair loss is becoming more common these days, it is still hard to deal with the situation. Nevertheless, there is actually a technique that works with most hair loss patient. And that is to eat the right foods. Chances are high that you can prevent hair loss by eating the right type of foods. 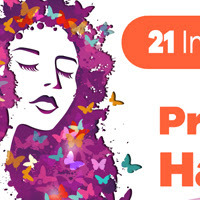 Below, you will find an infographic which will introduce you to the 21 best foods for preventing hair loss. A professional hair loss expert. She has years of experience in the fields of dermatology, also experience treating children and adults of all skin types and complexions.